On many of the Our Neighborhood best books lists, Dear Parent offers a beautiful invitation for new parents to prepare for a new baby without the guilt that is so prevalent in our society. “Dear Parent” was the first resource that inspired Our Neighborhood’s exploration and adoption of the RIE, Resources for Infant Educarers, principles. 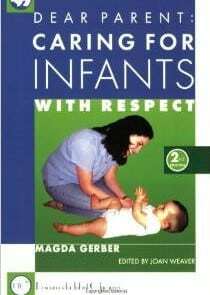 Written by Magda Gerber, the founder of RIE, “Dear Parent” is an inspiring introduction to infant care and education based on respect. Magda explores in the book how young infants build healthy attachment, learn to move, play, and how parents introduce limits respectfully. Baby Knows Best, with a bit more of a modern feel, is now our favorite RIE book, but “Dear Parent”, now in its second edition, provides an introduction to RIE through the words of its founder and is well worth exploring. Healthy attachment meets the needs of children and parents. Children’s needs are quite simple though meeting them is hard. Written in Magda’s voice while nice can be a bit outdated. Strict rigid adherence to any philosophy without reflection on how it serves your child and family is unlikely to work well.